When Dario and Wendy Marquez bought their home in The Water’s Edge community, the house was as much about potential as it was about reality. 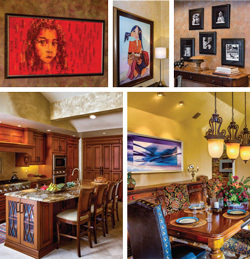 Where there were heavy, dark furnishings, Wendy channeled her vibrant vision. 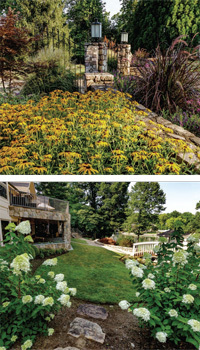 Where there was an aging water feature, landscape artist Norman Tharpe developed an elegant, flowing garden. Where there were obstructions, the couple created openness. 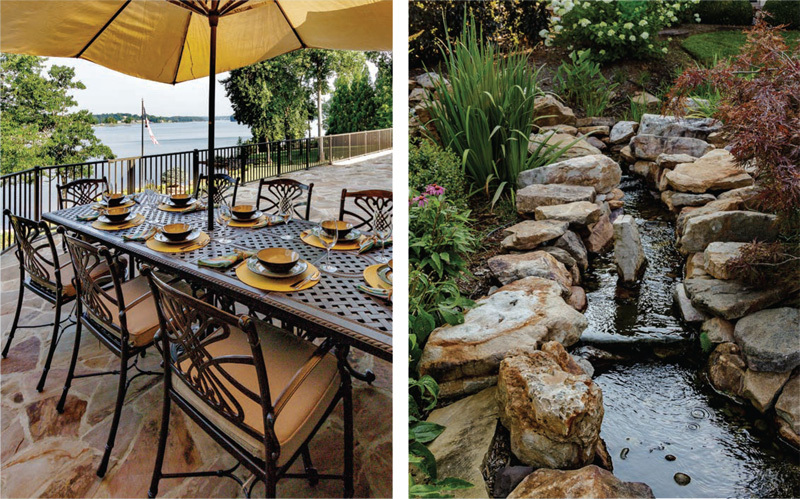 The goal was to have a home that would serve as a destination for far-flung family members to come together, where they could splash and lounge and laugh with the beauty of Smith Mountain Lake as their backdrop. And it would need to be a place where the Marquezes would feel comfortable retiring. Getting the home to that point was going to take time, and they were taking it piece by piece. The Marquezes live full-time in a condominium in Northern Virginia, where Dario runs two businesses. 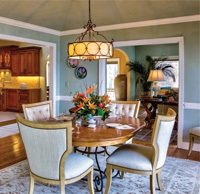 When they considered buying a second home, a friend recommended Smith Mountain Lake. Soon afterward, it seemed like they were meeting lots of people who had ties to the lake, and it sounded ideal. “We needed to find a place to have family gatherings and where the grandkids could come,” Wendy says. And with seven kids and 14 grandkids, they wanted someplace bigger than a condo that they could all retreat to. The home had plenty of room, a gently-sloped lot and a sandy beach away from the main channel, which made it a good fit for a family with young grandchildren. Coming from a condo, a place where their family could have room to run was key. The house had to be large enough to sleep many guests, and the couple didn’t want the slope of the land to be too steep. Wendy also said they didn’t want to be on the main channel, so that the little ones who visited could swim without the grown-ups having to worry about them so much. At one point, frustrated that they weren’t finding the perfect fit, they began looking at land and considered building their dream home. 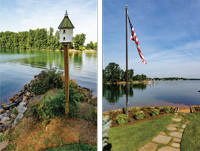 Finally, they came across their home in The Water’s Edge, situated on 1.5 acres. Though the interior didn’t resonate immediately with Dario, Wendy saw the potential. What really sold her? “The view of the lake, that’s it,” she says. An undefined space was transformed into a grownup cocktail room, with 10-foot glass sliders offering expansive views of the lake. The couple went to work on transforming the 8,000-square-foot house and making it their own. 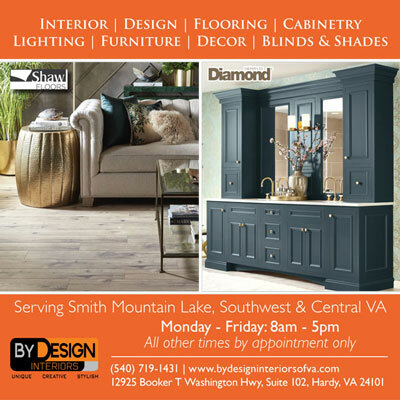 Their lake style differs from their Northern Virginia style in a way that captures the freshness and lushness of life on SML. Instead of heavy carpets, drapes and armoires that blocked windows, the Marquezes favored hardwood or tile flooring, a bright, clean appearance to rooms and clear sight lines to the lake. 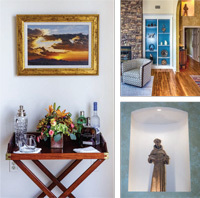 They opened up doorways and added skylights, as well as hung artwork that befit their tastes. And while it didn’t take long for this sixbedroom, seven-bathroom home to begin to show their tastes, the full renovation took several years. The first room through the front door was perhaps the most challenging to revamp. When Dario and Wendy purchased the home in 2011, this undefined space embodied the personality that was originally throughout the residence: muted colors and small doors that didn’t capture of the home’s expansive views of SML or the laid-back sense of lake life. As Doherty explains, the room was functional, but it wasn’t really working. It was a great room that wasn’t coming across so great. So out came the six-foot-tall doors that exited onto the deck; they were replaced with 10-foot sliders that allow you to see both the water and the sky simultaneously, creating beautiful horizontal and vertical panoramic views of the lake. The first thing you see today upon entering the home is a more complete picture of the serenity and allure of SML. Completing this room involved two rounds of furniture selection—the Marquezes donated their first choices of chairs and tables after Doherty was hired—and from there, the room’s signature came together. The light and welcoming formality of the updated space has made it the perfect spot for a grownup cocktail room, particularly while the extensive family is visiting. The room that long lacked an identity ultimately became a showcase for how this home has been transformed. “It’s more of a warm contemporary look, so it looks clean. That’s something that Sean has been very good with, giving us that warm, temperate feel with clean lines throughout,” Dario says. 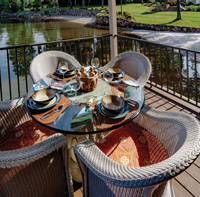 Among the lengthier projects was redoing the deck with stonework, while enlarging the space by about 40 percent. Renovations by M.H. 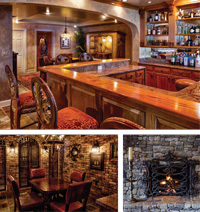 Eades Custom Builders improved accessibility to lake views, brought more meal opportunities closer to the living room and kitchen, and created a better flow to social gatherings. The footprint of the 1990s-era home hasn’t changed, but its aesthetics have been revolutionized. Paintings throughout the home were purchased from exotic locations such as St. Croix and Peru. Another painting, which hangs on the wall of the revamped study, was commissioned by the Marquezes and made entirely using a stamp of the word “hope” that comes alive with the striking face of a Latina girl. A statue of St. Francis watches over the front door. Rare signed images from famed German-born photographer Fritz Henle grace one of the downstairs walls. The spacious master suite features a window-lined sitting room, offering views of the water. Down the hall from the front door, the Marquezes have a spacious bedroom with a window-lined sitting area that allows them to absorb the views of the water. Hardwood and tile flooring is spread throughout, and the master bathroom has plenty of elbow room. Five guest rooms, including one suite that nearly rivals the size and airiness of the master bedroom, are on the lower level adjacent to a recreation area. “We like to tell people that we invite to our house, ‘You really have your own space.’ You can walk directly out to the lake, you have all the amenities you need,” Dario says. An enchanting water feature flows around the property, from the front of the house to a small pond above the sandy beach in back. The lower level boasts a fireplace with an intricate iron screen surrounded by leather furniture to create a cozy seating area. Nearby, there’s also a card-game table, rubber-floored exercise room, a well-stocked wine cellar featuring exposed brick and a tasting table, and a wood-topped wet bar with eight chairs. “I love having a bar—I love sitting at the bar, I love entertaining at the bar,” Dario enthuses. The lower level spills onto a beautifully landscaped yard. 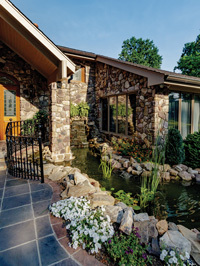 Snaking from the exterior of the front doorway to the backyard is a flowing water feature that collects into a small pond just above the sandy beach and spacious dock suitable for entertaining. 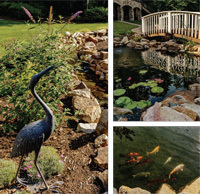 The water garden was fully redone by Norman Tharpe, the award-winning owner of Water Garden Designs by Tharpe, and features waterfalls, creek beds and redesigned ponds to enhance the property. 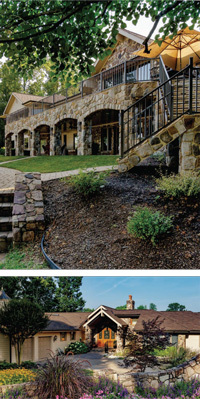 “This new artistic and tranquil design helps bring the landscape to life, and creates a place for relaxation and reflection for this beautiful home at SML,” Tharpe says. Most of all, Dario and Wendy have created the cherished family getaway destination that they sought from the beginning. With the kids so spread out—from New York and Chicago to Virginia and South Carolina—family time is particularly special time. During the warmer months, the Marquezes spend almost every weekend at the lake.